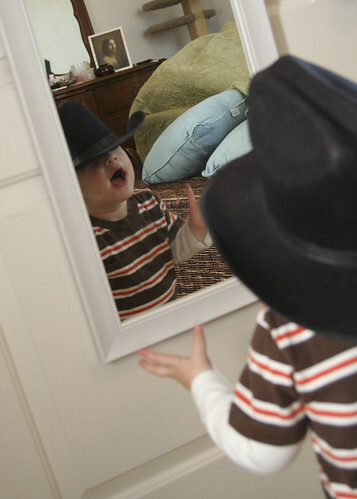 The C&C Burkman Family Blog:: Yee-haw!!! 4 posts in January led to nothing in February. But, that’s just what happens when life gets crazy, and last month was just that. Cindy is full-on 1st trimester pregnant, which is playing out similar to her pregnancy with Carter. Unfortunately, this means nausea and morning sickness all day. We went to our primary care physician and we were told that there’s actually medicine to help with this. Cindy went on zofran and, sure enough, it worked just like it was supposed to, curbing her nausea almost immediately and allowing life to continue at a somewhat normal pace. The other crazy part of the month was Cindy and Carter heading off to visit her parents in California for a couple weeks. I seriously underestimated how long 13 days is when you’re home alone with only work, school and a couple of cats to keep you company. I survived the ordeal, but only barely. They had a great time and took lots of pictures; none of which I’ve uploaded yet, so I’ll leave Cindy to blog about that some other day. Aside from that, it’s business as usual. I’m still working and going to school, and Cindy is at the house all day with Carter; running the show here at home. It’s been working great so far and we’re definitely lucky that this is even an option for us at the moment. Carter is 19 months (still blows my mind when I stop to think about it) and starting to talk more. Multi-word sentences? Not so much. But he understands what we say and he even listens and helps out whenever we ask him to. Will this last? Who knows, but we’re taking full advantage of it. There’s video of him tearing up and down the hallway on his trusty steed, too, but I’m better off posting this now rather then hoping I find time to edit the video in a timely manner. 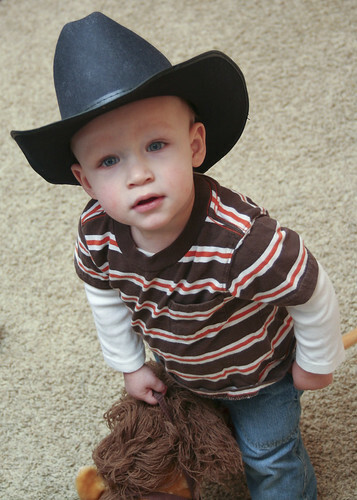 What a cute little cowboy! I will have to tell sarah (my sister) about that medicine for morning sickness. she is having a hard time lately. By the way, congratulations on the pregnancy!!! LOVE the first picture of Carter, oh my gosh. And you guys finding those pills is like life changing!! That first picture is really a great one. 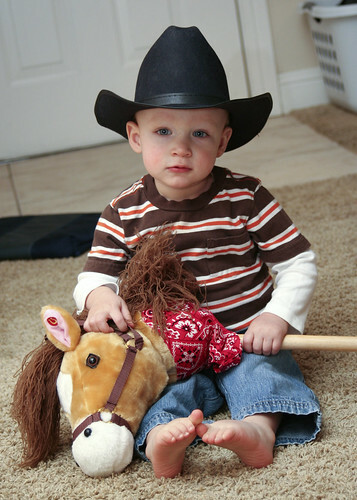 I went a little horse crazy too after my first visit to Cindy's house. It is normal. Oh how CUTE!!!! I Love that he loves horses!!! Fun times! Thanks for all that you guys for my family!! Sure love and miss you guys!!!! Glad Cindy is feeling better :-) Hopefully y'all will be at Kirsten's wedding and I'll get to see you! Carter is adorable and I am glad that Cindy is feeling better.